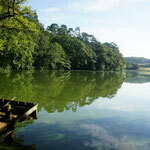 Fontaine-Daniel is a friendly village with a tranquil atmosphere. 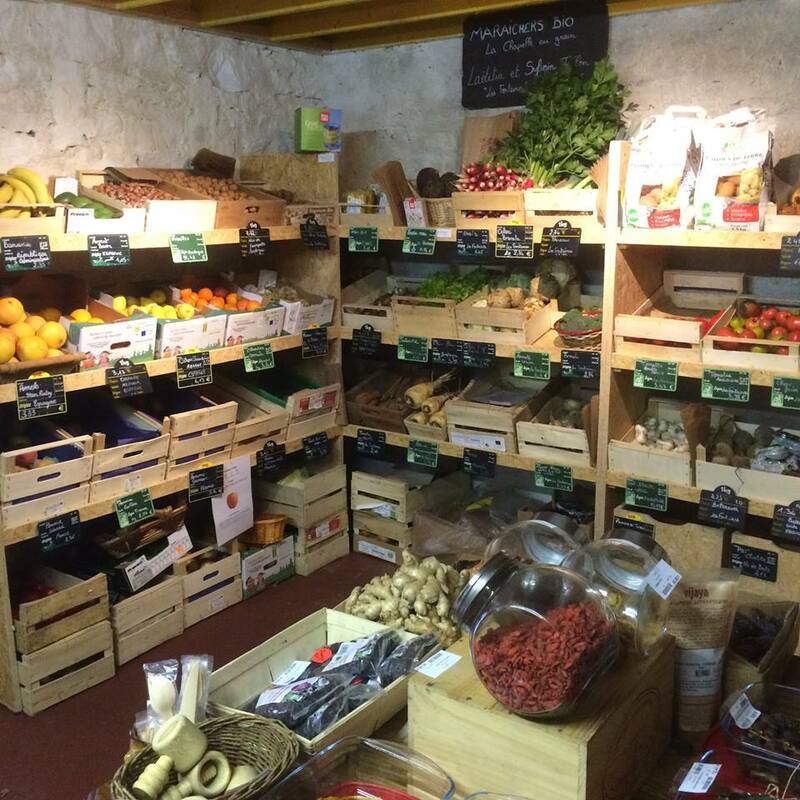 It has a wonderful organic co-operative épicerie (see photo above!) which has a bar, library and bookshop, food shop and bistro. You will regularly find music and cultural events there. Fontaine-Daniel also has a cozy cafe in the friendly village bakery which regularly holds art exhibitions. Take coffee in its secret garden around the back, or enjoy a galette in the friendly creperie or indulge yourself at the excellent restaurant. 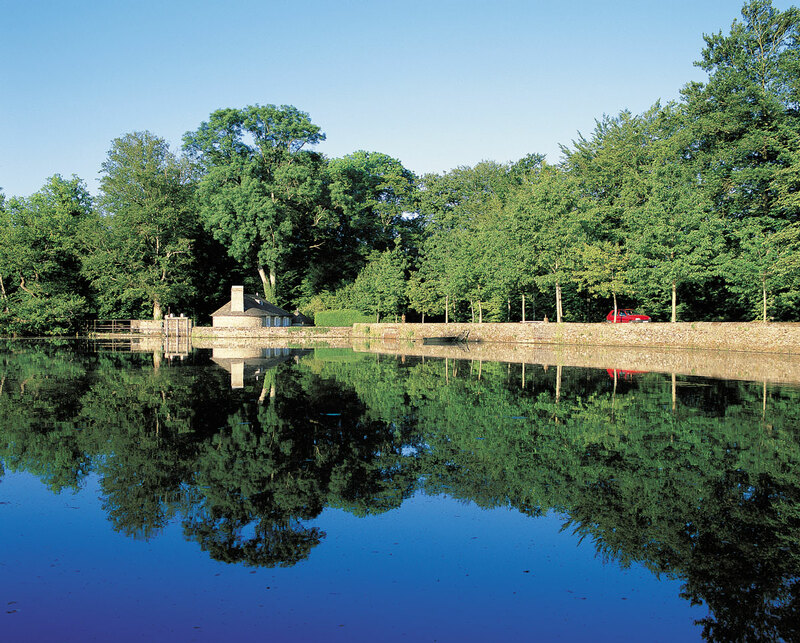 After you can relax with a wander around through the allotments, see the cabanas or walk around the lake and see the chapel. 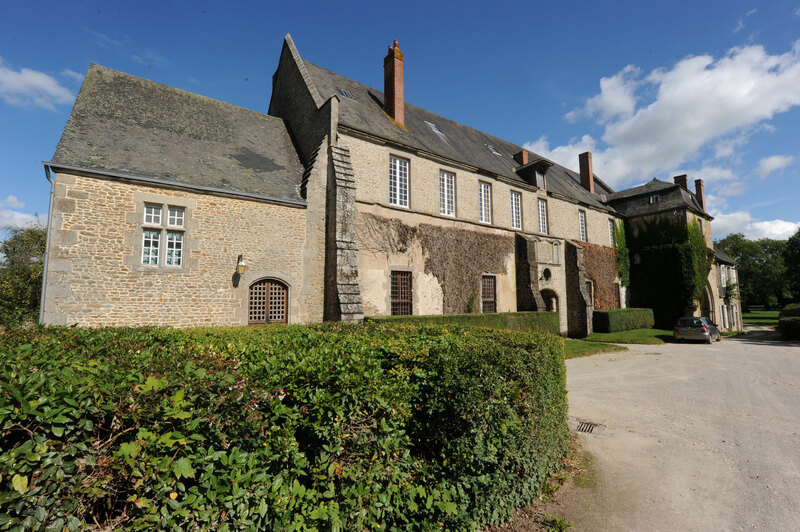 Alternatively, if you wish to visit the convent of Bois-Salaire which nestles in the woods within walking distance of the village, (whose nuns makes beautiful candles and tissanes), it can be visited by appointment. No trip here is complete without a visit to the Toiles-de-Mayenne shop to touch the beautiful fabric which is made right here in Fontaine-Daniel. Toiles de Mayenne is an independent company employing 105 people, 65 people work in Fontaine-Daniel and 40 in their shops around France. Toiles de Mayenne design and create the fabric as well as an atelier. The collection consists of around 600 designs, a quarter of which are renewed each year. The atelier located in Fontaine-Daniel make one-offs, such as curtains, blinds, voiles, sofas, bedspreads, cushions, etc. Toiles de Mayenne design can also be found on sofas which are are manufactured by French and Italian subcontractors. From a factory, Toiles de Mayenne has gradually become a cottage industry. In 2008, it received the EPV label - Entreprise du patrimoine vivant- A label awarded by the French State to small independent companies with traditional skills and manual know-how. For the last 210 years, the company has been in Fontaine-Daniel. In the nineteenth century, it consisted mainly of spinning and weaving and provided work for around 500 people. In the twentieth century, this number was 300, involved in the main activities of weaving and dyeing. 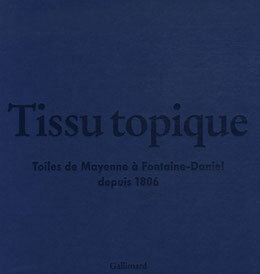 In 1968, the first Toiles de Mayenne shop was opened in the Yvelines department. 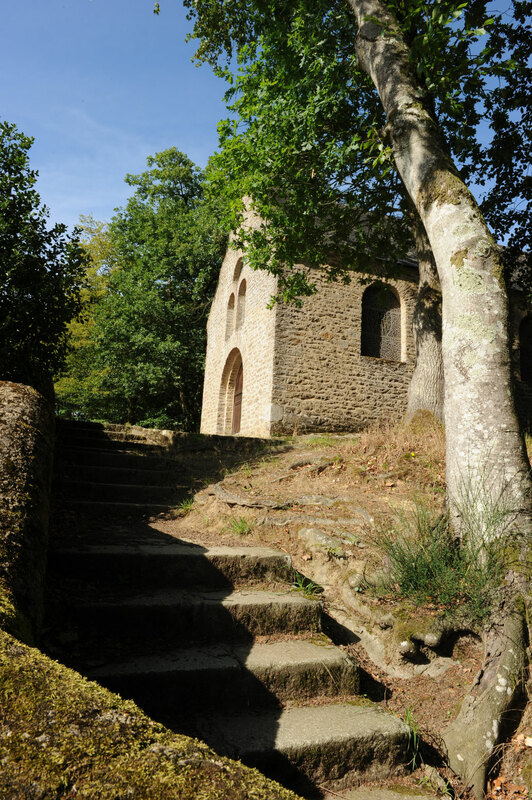 The Orthodox Monastery of “Nativité la Mère de Dieu” (the Nativity the Mother of God) is located in the forest of Bois-Salair, just outside Fontaine-Daniel (direction Alexain). Established since January 2014, the nuns punctuate their day with work and prayer. In an exceptional setting and in very varied fields, they work with their hands to provide their livelihood, within an ecological approach the respect for creation mirrors man’s duty towards his Creator. In this same spirit of continuity of dynamic living, they live and celebrate the liturgical services according to the spiritual tradition of Orthodox monasticism. You can find their products at the Monastery shop on Fridays and Saturdays from 3pm to 5pm. 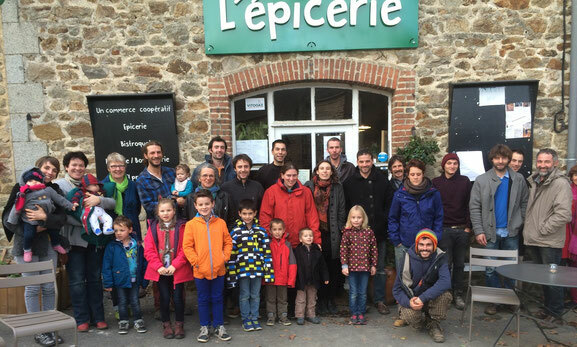 A collective of residents of Fontaine-Daniel and the association of municipalities of Mayenne highlighted the lack of a local grocers. This idea blossomed into the creation of a cooperative. 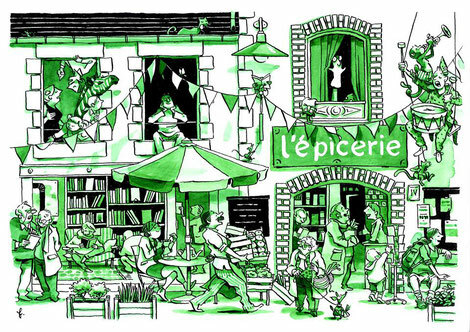 L'epicerie promotes direct sales from producers with local, and when possible, organic food products: fruits, vegetables, cheeses, dairy products, dry products, oils, meats, drinks, etc. More than just a grocer’s, this new place is above all friendly with a bistroteque corner where one can enjoy food and drink as well as a bookstore. The shop also provides a number of services: internet and information for ramblers/hikers. Some entertainment is also planned in the afternoon or in the evening, ensuring that the space is also a place for interactions, meetings and conviviality. Patrice and Claudine are your hosts at La Forge restaurant in the heart of the village of Fontaine-Daniel. Fine dining, calm and tranquillity assured! 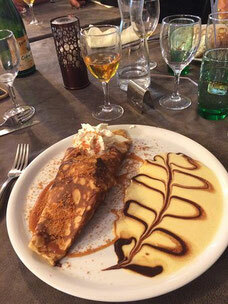 In the square of the small village of Fontaine-Daniel, the creperie and bar at Le petit monde offers you a warm welcome. In summer the meal is served on the terrace under sun, peacefully overlooking the village square with its beautiful chestnut trees. In winter, the inside space is very comfortable and very cosy. The corner near the large fireplace is perfect to enjoy some time as a couple, with family or friends. Ouvrage collectif publié par Les Cabanons, aux édition du Palais. Collective work published by Les Cabanons, at édition du Palais. 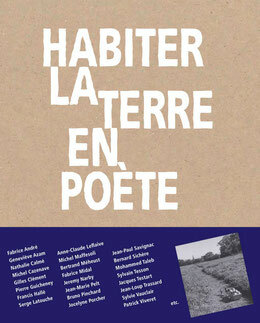 A beautiful object that smells of paper and printing ink, beautiful typography, beautiful images, a superb collection of texts Bringing together authors like Patrick Viveret, Serge Latouche, Mohammed Taleb, Jean-Marie Pelt, Michel Casenave, Jeremy Narby ... to name a few ... this book brings together all the speakers at the Fête de la Terre in Fontaine-Daniel. 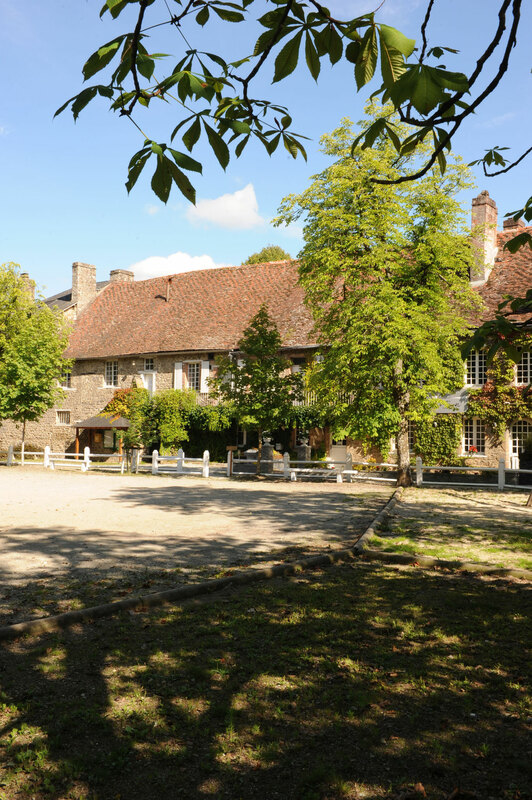 In the aftermath of the Battle of Austerlitz, a couple of Parisians set up a spinning mill a few meters from the Cistercian Abbey of Fontaine-Daniel, in Mayenne. It is the beginning of a great industrial and social period, punctuated by colourful characters, and by the singularity of this place that remains intact, a village Built Entirely for the families of the textile workers. Like its fabrics, Toiles de Mayenne has stood the test of time by the perpetuation of a quality product, echoing the preserved harmony of its native site. Its history shows its constant adaptation through economic crises and wars. Warping, creel loading, reeling, Bonding, tucking, sanforising, splaying, threshing, knotting, weaving, engraving, packaging, embossing, dyeing. In the early 21st century, the company still presents a complete integration of all this know-how. Such a variety of textile trades concentrated in a single location remains unique in France. 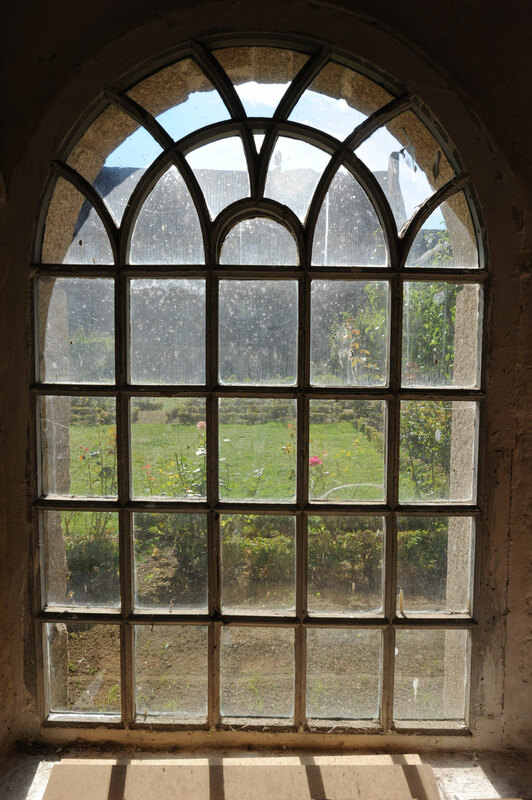 The History of a factory established in an old Cistercian abbey and the village of Fontaine-Daniel who was born from it. Available in all Toiles de Mayenne stores and in l'epicerie in Fontaine-Daniel. 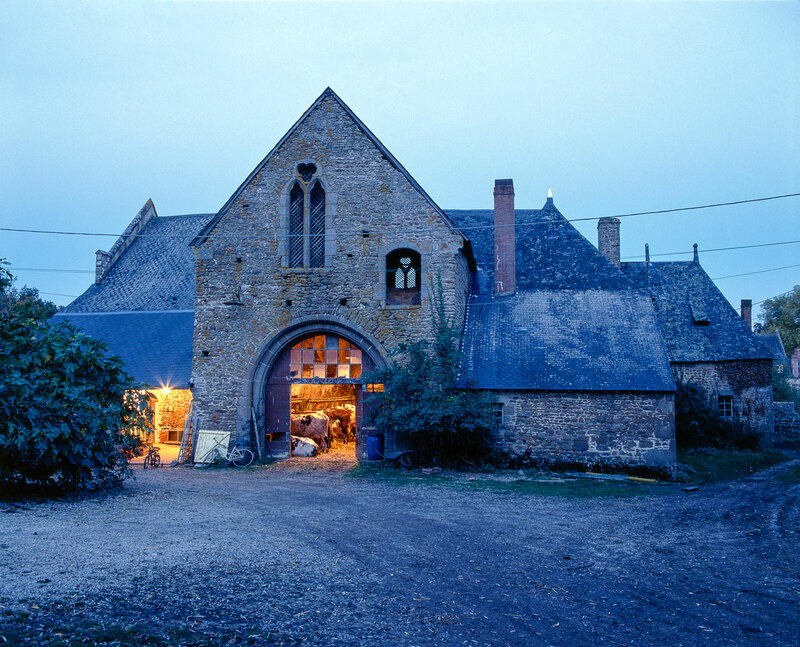 Nestled within a backdrop of greenery at ‘Tilleul’ in Fontaine-Daniel, lies an artistic workshop in which you can discover calligraphy, illuminations and plant based art. Courses are given by Mrs. Chantal Lemee qualified in the art of beautiful writing. Latin calligraphy has evolved over the centuries and history enlightens, explains the forms of letters, As well as the technical aspect. The qualities required are summed up by the rule of three P's: Patience, Perseverance, Pleasure. Absolute beginners, semi-beginners, experienced students meet up on Saturday mornings or afternoons On the basis of an annual calendar and a project. The summer period is punctuated by three-day courses based on a theme where calligraphy and illumination are intertwined (art of manuscript illustration). Creativity is at the heart of these encounters. The number of participants is limited in order to cater for everyone’s needs and all within the spirit of sharing. So, take the step and find serenity and calm by making letters dance. In 1806 - The Birth of Manufacturing. 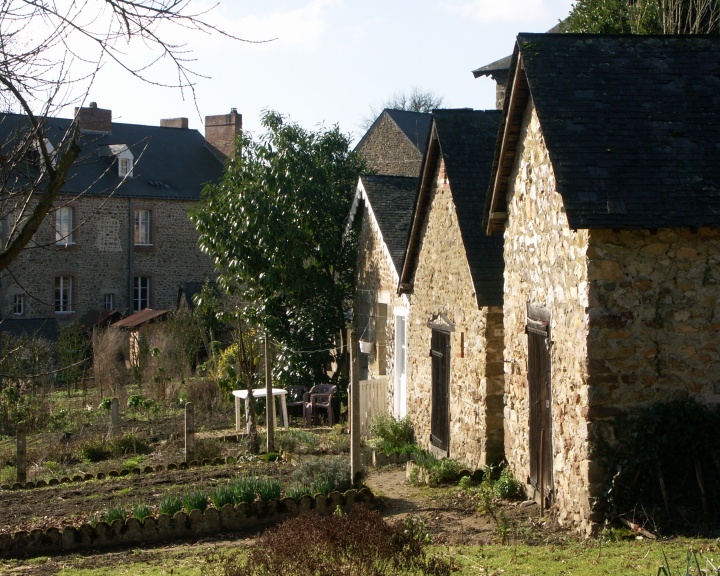 In July 1806, Two textile pioneers from Paris arrive in Fontaine-Daniel, a hamlet situated 5 kilometers from Mayenne and install themselves in the Cistercian Abbey which had been left deserted since the Revolution. War is raging in Europe. Napoleon Bonaparte proclaims a blockade against the English. These pioneers set up their first spinning mill and then their first weaving workshop. Success comes quickly. In 1809, 325 flying shuttle looms are at work. 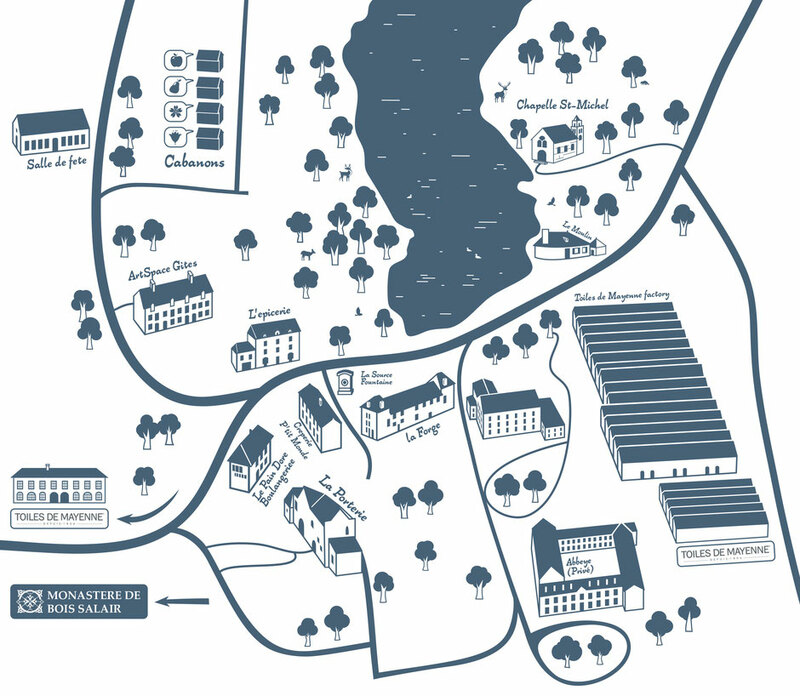 By 1814 there are 40 employees in the spinning mill, 430 in the weaving workshop and 450 home-based weavers. In 1814, Sensitive Armfield, a 21 year old Englishwoman, marries one of the two founders and together they run the business. In 1828 she becomes a widow and alone takes over the running of the company for almost 40 years. In 1832 she recruits Martin Denis, her nephew by marriage and an engineer by profession. 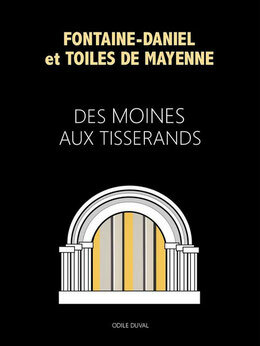 He is the first of the Denis line, whom six generations later still run Toiles de Mayenne. Sensitive Armfield is a fighter. For several decades, armed with two pistols in her belt, she crosses each week through open fields the five kilometers which separate her from the town of Mayenne where the bank is located in order to pay her 500 or so workmen and workwomen. Sensitive Armfield passes the reigns of the company directly to Gustave Denis, the son of Martin. Gustave graduates from the Central School in 1854 and leaves to train himself in a cotton mill near Montargis. In 1862 he is called to Fontaine-Daniel to modernise the weaving processes. Two hundred new weaving looms are installed. He becomes president of the General Council of Mayenne (1883 – 1925), where he establishes the Republican Party, and then senator (1906-1925), during which period he develops child labour legislation. In 1832, the first communal building is erected to accommodate the workers and their families. Others will follow up until 1920. Successive leaders of the company take an avid interest in architecture and realise their projects. It is the company’s own workers, stonemasons, roofers, carpenters and electricians, who build the buildings themselves. 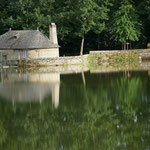 Fontaine-Daniel is today considered one of the most beautiful villages in the region of the Pays de la Loire. Jean-Denis, director from 1920 to 1968 used the ‘golden ratio’ (evident in the work of architects Bauhaus and Corbusier) for the measurement proportions applied to the workers’ homes and the manufacturing buildings, as well as in the Saint-Michel chapel which was constructed in 1939 and can be found next to the lake. Jean Denis is a pragmatic engineer, trained at the Central School of Paris. Like his grandfather Gustave he is also passionate about social issues. He runs the company with his brother Bertrand, his deputy from 1958 to 1978. Shortly after taking over the company in 1924, he asks the family shareholders to forgo their dividends. He argues that the company’s profits should be put to the use of the common good: through industrial investments and the development of the village, where workers and their families need to live with dignity. His fellow shareholders will agree. Throughout the 60’s, Toiles de Mayenne continues its metamorphosis. Its clothing fabrics become decorating fabrics. For two decades, and up until the opening of its first shop, the company sells its productions via mail order to the four corners of the country. The idea of offering custom made products becomes a reality in 1961. 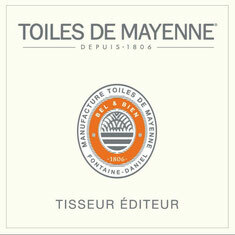 Toiles de Mayenne hires seamstresses who develop curtain forms, bedspreads, valances, cushions and net curtains. In 1970 the workshop consists of forty people. In 1968 the first Toile de Mayenne store is officially opened in Montfort-l’Amaury in the department of Yvelines. After custom made products, advice in interior design is added to the services of Toiles de Mayenne. In 2016 the company has 15 shops of its own in France. Its fabrics are also available in 40 multi-brand shops in France and 30 multi-brand shops throughout Europe and the world. Our interior designers welcome our clients in our shops or by home appointment. 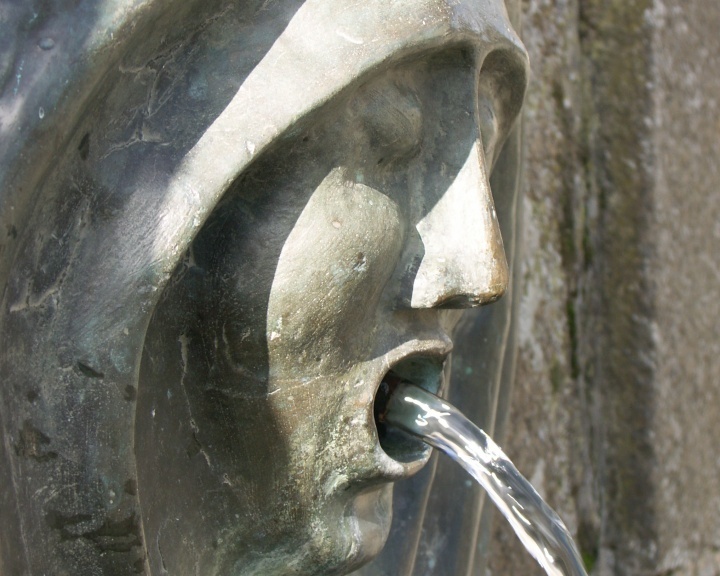 Since 2004 the Festival of the Earth is organised each year in Fontaine-Daniel by the local association. For three days, at the beginning of September, anthropologists, artists, philosophers, artisans, writers and economists, of national and international repute, gather to discuss and debate their ways of inhabiting the earth. 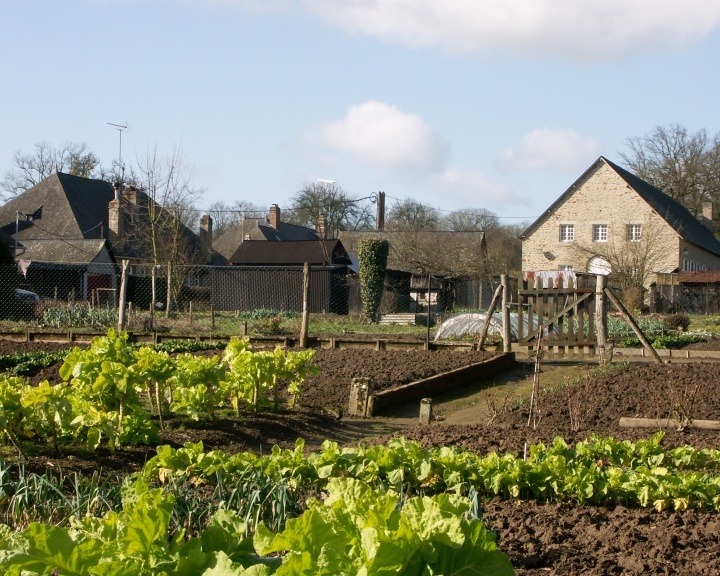 According to the participants, this village, set as it is in a woodland clearing with its architecture preserved, dominated by century-old trees, is ideally placed for reflection on our world as it is. On the 26th of June 2006, the bicentennial of the birth of textile activities in Fontaine-Daniel is celebrated. The publisher Gallimard publishes a book entitled “TissuTopique” which traces two hundred years of a French, industrial, social and architectural adventure. A team of historians, writers and artists, brought together by Toiles de Mayenne and Gallimard, are given carte blanche to create this unusual book. The majority of the company’s equity is held by those involved in the company including its leaders, the seventh generation of the same family. 115 people are employed by the company. 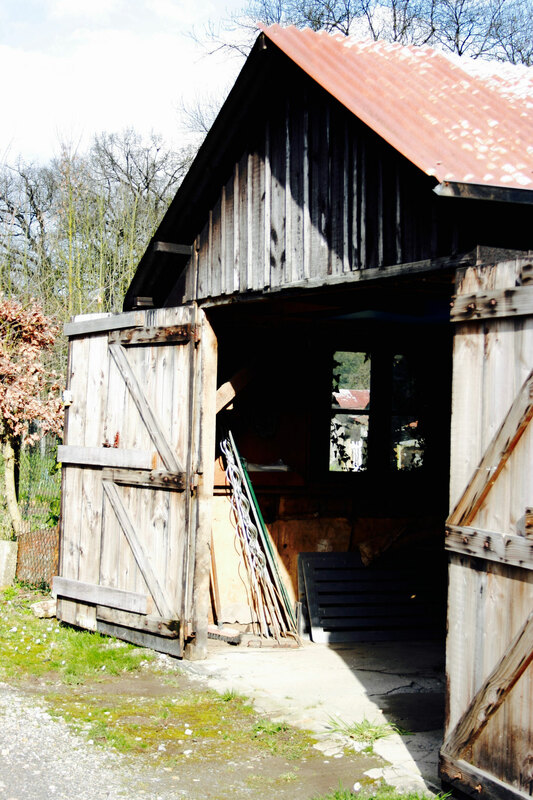 Toiles de Mayenne also works with stylists and designers to permanently renew its collections. Close to 25,000 custom made items leave the workshops each year: curtains, blinds, net curtains, sofas, and cushions.